The American Buffalo chicken wing is a scary thing. First, who ever heard of a buffalo chicken? I had no idea what it was for the longest time. Second, the person who came up with buffalo chicken wings was a genius. You deep fry the wings and then add spicy sauce to get a fatty, spicy, crunchy, incredibly delicious when paired with beer, messy, treat. I had no idea how fatty they were until I started paying attention (and I am sorry I did). This buffalo chicken wing makeover is for the enthusiast who knows that she needs to lay off the regular stuff. You get chicken and the spicy sauce but you greatly reduce the fat (no deep frying and 99% breast meat). These are good! I liked them a lot but I found that they were best served hot (both the temperature and the spice). You can keep them hot in a small slow cooker if you are having a Super Bowl party. Chicken breast meat is flavorless so the addition of painfully spicy sauce is a great idea. Do you have a Buffalo chicken wing problem? Have you solved it? Preheat oven to 400 F. Line a rimmed baking sheet with aluminum foil for easy clean-up. In a large bowl, mix onion, garlic, bread crumbs, and salt. Add chicken breast and mix until blended. Divide meat into four equal sections. For each section, roll 5 balls and put on baking sheet until you have 20 meatballs. Bake for 15 minutes until cooked through. At this point, you can store the meatballs or move on to the next step. Add buffalo wing sauce to a small sauce pan or small slow cooker. Heat sauce until warm and add meatballs. Stir to coat meatballs. Serve hot with toothpicks. Looks deish but can you clarify whether the chicken is raw? pre-cooked? shredded? ground up? You should mention somewhere that the chicken is ground. I have never made these, but it is on my "to try" list -- I have a cousin that makes them with frozen turkey mini-meatballs in a crock pot - I thought they were homemade until I asked for the recipe. I think she puts a little butter in the sauce. May make these for Super Bowl! Hi, this sounds great! I have a stupid question though - did you use ground chicken breast?? Whoops! I added that the chicken breast is ground above. Sorry about that. I have had a bad headache for a few days and my brain is fuzzy. Thanks for the help! looks wonderful - what is the serving size? is it 1 points+ per meatball or do you get more? 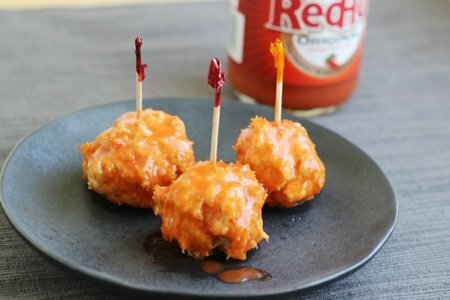 I love your recipe Snack Girl and here is one for making buffalo wings in the pressure cooker! Lots of good, fast, skinny recipes on this site. Well this is different for super bowl. In the ingredients list it says ground. I'm going to try these for Super Bowl party!!!! !